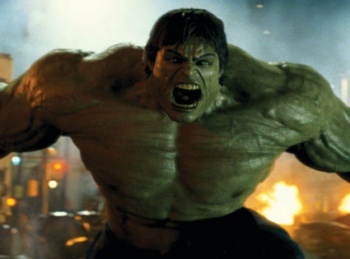 Marvel Studios has announced that The Incredible Hulk will be appearing in the Avengers movie, but Edward Norton will not. Marvel is assembling an impressive cast for the 2012 Avengers movie: Robert Downey Jr., Scarlett Johansson, Samuel L. Jackson, Edward Norton - no wait, scratch that last one. Edward Norton will not be reprising his role as everyone's favorite scientist-with-anger-management-issues, Bruce Banner, as the studio has decided to recast the part with another actor. "We have made the decision to not bring Ed Norton back to portray the title role of Bruce Banner in The Avengers. Our decision is definitely not one based on monetary factors, but instead rooted in the need for an actor who embodies the creativity and collaborative spirit of our other talented cast members," said Marvel Studios President Kevin Fiege, Speaking from the set of Captain America: The First Avenger. "The Avengers demands players who thrive working as part of an ensemble, as evidenced by Robert, Chris H, Chris E, Sam, Scarlett, and all of our talented casts. We are looking to announce a name actor who fulfills these requirements, and is passionate about the iconic role in the coming weeks." It's disappointing that Norton won't be appearing in The Avengers, as one of the most exciting things about the film was that it brought all the recent Marvel movies together, but exactly how much screen time Norton would have gotten in a movie with at least four superheroes in it is anyone's guess. The Avengers is scheduled for release on May 4th, 2012.